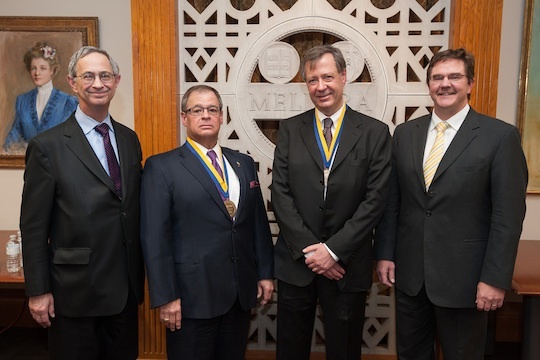 Riccardo Betti, professor of mechanical engineering and of physics and astronomy at the University of Rochester, was named the inaugural Robert L. McCrory Professor at an installation ceremony on April 3. Endowed by an anonymous donor, the professorship honors Robert L. McCrory, who has been the director of the Laboratory for Laser Energetics (LLE) for three decades. "Riccardo is an internationally recognized leader in the domain of fusion energy research," said Robert L. Clark, senior vice president for research and dean of the Hajim School of Engineering and Applied Sciences. "It is very special for the University to have a scholar of his caliber be the inaugural holder of the Robert L. McCrory Professorship." "Professor Betti is an exceptionally talented scholar and I am honored with his appointment as the first scholar to occupy the Robert L. McCrory Professorship," said McCrory, who also expressed his gratitude to Raymond J. Mayewski, M.D., professor of medicine and chief medical officer at the University of Rochester Medical Center, who was "instrumental in securing the funding for the McCrory Professorship from a grateful anonymous donor." At the same ceremony, McCrory was himself named University Professor. Betti is also the assistant director for academic affairs at the LLE. Prior to joining the LLE and the faculty of the University in 1991, Betti received his Ph.D. in nuclear engineering at the Massachusetts Institute of Technology (MIT). Betti explained that his goal to perform fusion research attracted him to Rochester. "Fusion experiments are very expensive, and the scale of the experiments usually are outside the normal scale of a university experiment," Betti said. "So there are only very few places that have fusion experiments of this scale and that are associated with a university." In Rochester, Betti said, he could find both. The University's LLE comprises the OMEGA 60 laser system (inaugurated 1995) and the OMEGA EP laser system (inaugurated 2008), which scientists from around the world utilize in their quest to develop nuclear fusion as a reliable energy source. "Fusion has the promise of an unlimited energy source for the future," says Betti. But bringing that promise to fruition, he cautions, is "incredibly complex." Betti conducts research in two areas: inertial confinement fusion � with a focus on the hydrodynamic instability of inertial confinement fusion capsule implosions � and magnetic fusion energy. In 2011, Betti received the Ernest Orlando Award from the U.S. Department of Energy for a series of theoretical discoveries he has made in the physics of inertial confinement fusion. He has also received the leadership award from the Board of Directors of the Fusion Power Associates "for the leadership he has been providing to the U.S. and world inertial fusion efforts," and the Edward Teller Medal from the American Nuclear Society for his "seminal contributions to the theory and understanding of hydrodynamic instabilities, implosion dynamics and thermonuclear ignition in inertial confinement fusion." Betti is a fellow of the American Physical Society, the vice chair of the Division of Plasma Physics of the American Physical Society, and a member of the Board of Physics and Astronomy of the National Academy of Science. He served as chair of the National Research Council Plasma-Science Committee and vice chair of the Fusion Energy Science Advisory Committee. He has been the head of the theory department at the Princeton Plasma Physics Laboratory and visiting professor at MIT, University of Texas at Austin, the Institute for Theoretical Physics at the University of California at Santa Barbara and the Comissariat � l'�nergie Atomique in Paris. He also holds a baccalaureate/master in nuclear engineering from the University of Rome. Under McCrory's leadership, the LLE � the largest single laboratory and research program at the University � has established itself as a world-leading laboratory for the investigation of inertial confinement fusion. Since becoming its director, McCrory has been responsible for securing $1.6 billion in funding for the LLE. The laboratory has consistently received outstanding reviews from the DOE and the National Nuclear Security Agency. McCrory received his bachelor's and doctorate degrees in physics from MIT. He began his research in inertial fusion at Los Alamos National Laboratory, and came to the University as a scientist in 1976. He was named director of the LLE in 1983 and professor of mechanical engineering in 1986. He was also appointed to vice provost in 2006 and vice president in 2011. His honors include election as a fellow of the American Physical Society, and he has served on several National Academy of Sciences committees on military space policy and plasma science. He remains the national leader of the development of the direct-drive inertial fusion concept, and he has authored or co-authored more than 250 articles in scientific journals.